Hello, and welcome to your Lunar Eclipse choose-a-card Angel Messages! If you haven't already selected a card, please do so now. Then read below to discover what the Angels want you to know right now, as we shift into Higher Consciousness with this Lunar Eclipse in Aquarius. I deliver these messages intuitively. They are not regurgitated from the book that came with the deck. I've tapped into Spirit to deliver these messages from the Angels just for you, for your Highest Good & Spiritual Evolution. 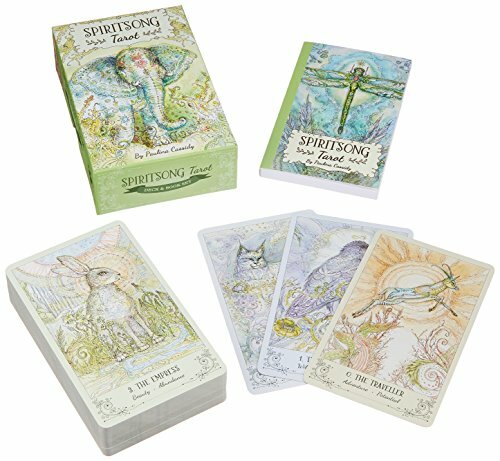 These cards act as a portal through which I connect to channel Divine Guidance for you. I encourage you to look at the images of your selected card & see what comes to you through it! Use your own intuition to expand on the messages you receive here for even greater clarity & love. You are blessed with outrageous ideas that may come to you out of nowhere. These may be wilder than usual ideas for you that may seem a bit ludicrous at first, but yet... you find yourself entertaining them. Considering what if it were possible to pull this off? Catch yourself if you resist or dismiss ideas that seem larger than life to you. I feel you may be becoming more and more aware of how your mind operates and discovering new ways to animate your Life & the world around you. These ideas of yours are divinely guided, although YOU must be the one to bring them into fruition. You must summon the courage to bring them to Life. Trust that you are more than good enough, strong enough, smart enough, brave enough to actualize these ideas. You are brilliant and it is time for you to own that! Taking action on these ideas may come with twists and turns you won't expect.. It makes the journey quite thrilling and the journey of manifesting these things is something that is a beautiful part of your Soul's evolution in this Lifetime. While you may need time in solitude to hash out the details of your plan or process, remember to take supreme care of yourself (like, don't forget to eat while you're furiously sketching that blueprint or painting on that canvas!) & remember the value of connecting with others who love & support you. Did this message resonate with you? Let me know in the comments below! To receive personal mesages that apply only to you, take a look at the Readings & services I offer here. You may have lost touch with your own ability to enjoy pleasure for pleasure's sake. Your heart may feel heavy after some losses and/or disappointments, either in the recent past or even decades ago. This Full Moon Lunar Eclipse seems to have triggered something within your heart that is now asking to be released. Your mind may begin to wander, perhaps feeling nostalgic but not fulfilled, as though your best days are behind you. You may be unable to see the beauty of your Life as it is right now. Your Angels reach for you to comfort you. When you are quiet and relaxed, you may feel their hand on your shoulder or suddenly feel like you're cloaked in a warm embrace. You are deserving of pleasure. Now. There is nothing you must do to deserve it and no way in which you must "earn" it. Joy, Happiness, Pleasure is a beautiful part of this Universe that you are a vital, unique part of! You are a Divine Being of Light. Pleasure is high vibe! These thought patterns are highlighted now for you to move beyond them. They no longer serve you and you are now guided to invite more joy and pleasureable experiences into your life. This is like choosing to be happy for no reason at all. Doing something just for the fun of it. Let loose and pick up that thing you love to do, but have not done in forever, or indulge in something that is only for you -- even if there are bills to pay or other people that you support who need things, too. (This is an invitation to add yourself to the list of people who deserve nice things and enjoyment, not an excuse to disregard all responisibilty, of course.) If you've been thinking of taking a vacation, go for it. You may have been caring more for others than for yourself, and this is a time to re-balance.. enter a new state of being and enjoying your Life. Be gentle with yourself. Archangel Raphael is with you to aid in your healing and has joined forces with other Angels in support of your health and evolution. They seem to circle you now, creating a band of Light that echoes vibrational harmony. You may be a healer yourself, or seeking the help of energy healers at this time. Your intuiton is strong and you are guided, ever so gracefully, toward the most effective remedies and modalities for you at this time. You may experience shifts within your body that feel unsettling or worrisome, as you heal physically or emotionally. Know that this serves as a release of toxic energy that you may have been harboring for some time. Open up to Love from groups of healers, even if you are healer yourself. You may feel even more connected and supported by like-minded individuals that you may have lost touch with in the recent past... it feels as though there is a resurgence of sorts available to you. You may be delighted by the outpouring of Love you receive from a group. Resist the urge to think the worst or blame outside sources for any chaos you feel within. Offer yourself loving kindness and take the time you need to ease into the healing process. This may be a journey into the unknown for you, as you step into deeper realms of your subconscious mind. You may be exploring depths you may have never encountered before. While this healing feels extreme, it ultimately is leading you to a Higher Vibrational state of being... where your physical self (health, abundance, who you identify as in the world) is transformed. If you have been meditating, you may suddenly find that you are able to meditate for longer periods of time now. If you are diligent with a fitness program or practice, you may experience a greater than normal "high" afterward. Your body may require more sleep during the next few weeks. Don't allow your dedication to your healing process or "self improvement" to interfere with much needed rest. Lovely opportunities are on the horizon for you! After a period of feeling a little bogged down or too busy, surprises show up for you that remind you that your Life truly is magical and you have the power to co-create all that you desire. You may have been recently working with the Law of Attraction and discovering (or refining) your ability to "manifest". It seems to come full force in the coming weeks, as you are amazed at how things seem to naturally come together for you. You may just feel ON. At the right places, at the right times. These magical occurences serve as an awakening for you. Through these new opportunities and joyful experiences, your heart opens up more fully and you are able to embody the vibration of Love. Your relationships are blessed, as well. If you've been feeling like you've lost something along the way within a bond with a partner or S.O. you may notice that spark of passion is easily revived. But, be mindful, this may require the release of an attachment to a situation of the past that may have caused you to harbor some resentment, first. It seems as though you may have already recognized this or have been working on forgiveness. If not, the time is now... and you may find it easy to let go and open up to more love. You are supremely supported by a community or organization you are involved in... If you've been considering reaching out to share a talent, skill or message that is truly heart-centered, know that there is no better time than now to ask. Ask and you shall receive, as they say. And celebrate the good feelings as they come to invite even more to flow through you. You'll be magnetic and irresistable, even, as you reclaim more of your Light through these delightful experiences! To receive personal messages that apply only to you, take a look at the Readings & services I offer here.